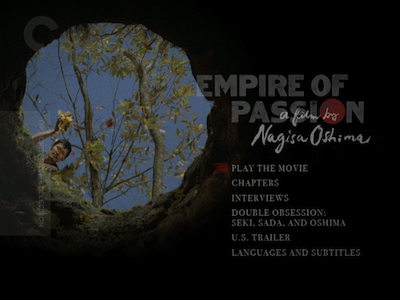 Respected Japanese film director Nagisa Oshima died at the beginning of this week. He was 80 years old. Part of the Japanese New Wave that took over cinema in the 1960s, Oshima was known for his bold flaunting of social mores. His films detailed obsessions of all kinds, though his own main obsession was exploring sexual desire. I was not a fan of all of his films, so deciding to review the only movie of his left in the Criterion Collection that I had not seen was a risky proposition. I didn't want what should be a tribute to end up being a hatchet job. As luck would have it, his 1978 Cannes prizewinner Empire of Passion turned out to be my favorite of what I've seen. 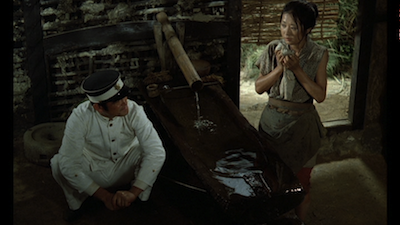 By embracing a more typical genre story, Oshima found a nice balance between traditional storytelling and the extreme impulses that made me think some of his other work was a tad adolescent. Here he manages to walk a carefully drawn line, spinning a good yarn while also addressing his usual thematic concerns and even finding room for at least one shocking scene. This disturbing occurrence--and you'll know it when you see it--is all the more startling for its late arrival, and for standing out as the one time in the when film the auteur strikes for the eyes--both literally and metaphorically. Empire of Passion is a ghost story set in a remote village of Japan at the very end of the 19th-century. Humble rickshaw driver Gisaburo (Takahiro Tamura) is married to Seki (Kazuko Yoshiyuki), a waitress who, despite being middle-aged, has retained her youthful beauty. They have two kids together--a toddler and a teenaged daughter, Shin (Masami Hasegawa). Shin lives away from home and, like her mother before her, works as a nanny. Seki also has an admirer, the recently discharged soldier Toyoji (Tatsuya Fuji, Black Sun [review]; In the Realm of the Senses [review])--though she doesn't actually realize that's even a possibility until Gisaburo makes a joke about it. Up until then, she assumed the young man, who is half her age, has been visiting with treats because he is lonely and likes her company. While this is still true, there is also more to his attentions, and when a drunken Toyoji finally decides to act on his desires, Seki gives in. Unfortunately, this is not enough for the young hothead. He is jealous of Seki's relationship with her husband, and he drags Seki into a plot to kill Gisaburo so he can have Seki all to himself. They strangle the older man and toss him in a well, telling the rest of the townspeople that he has gone to work in Tokyo. Three years pass amidst much gossip, but it's all just speculation until Gisaburo's ghost starts showing up around town. This unnerves Seki, who is undone further when a police officer (Takuzo Kawatani) comes to town to start investigating the rumors. Toyoji, whom so far the specter has avoided, tells his lover to play it cool, but there is no putting this string back on the spindle. Everything is unraveling. 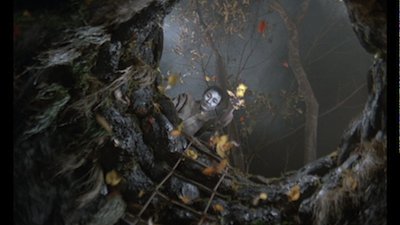 Empire of Passion was shot by cinematographer Yoshio Miyajima, who also photographed Masaki Kobayashi's Kwaidan, one the spookiest and most artful Japanese horror movies ever made. 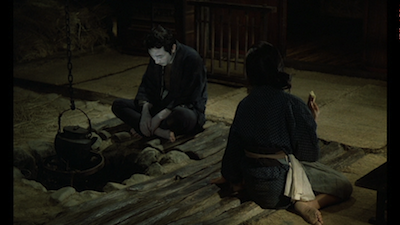 While Oshima's ghost story is neither as surreal nor as lush as Kobayashi's, Miyajima captures some of the same otherworldliness. Gisaburo appears as a pale figure, painted an ashen color, undeterred by doors and walls. In one memorable scene, he forces his wife into his ghostly rickshaw and takes her on roads she doesn't recognize, claiming to have forgotten the way home. When she tries to stop him, his features disappear, and he becomes a faceless apparition reminiscent of the dream figures the old professor sees in Ingmar Bergman's Wild Strawberries. It's a great pit stop on the way to full-blown madness. If sexual urges compelled Seki and Toyoji to murder, then it's fitting that the crime not only makes it impossible for them to be a real couple, but also that the haunting pushes them further apart. Their celibacy is a consequence of their guilt, and the closer they get to the truth coming out, the hornier they become. Oshima has structured his story to have a delicious symmetry. Hoping to recapture happier days, Toyoji proposes role-playing where he and Seki pretend they are just as they were before they first gave in to their lust. This grotesque reset plays essentially just as it did the first time, but only now their true natures are exposed and they can't cover them up again. Like Adam and Eve eating of the fruit from the Tree of Knowledge and realizing they are naked, the killers can't bring their victim back to life and rekindle their passion. They both revert to something primal, driven only by impulse, and punished for their lack of discretion. Unsurprisingly, the judgmental folks around the killers are just as bad as the people they would condemn. All are driven by passion in some way, be it the gossipy villagers who thrive on their scandal or the police officer who resorts to torture to get confessions out of Seki and Toyoji, succumbing to barbaric tactics he previously claimed to be above. Their empire claims him and his inhibitions, no matter how pure he tries to remain, no matter how white his uniform. There is poetic justice in Oshima's scheme, then, when a chill settles over the town after their would-be king and queen are removed. 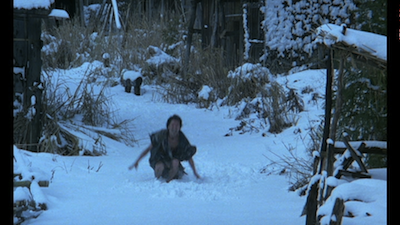 The final shot of Empire of Passion is of Toyoji's brother, the village idiot, alone in the snow, fighting against some invisible presence. He carries on chasing ghosts, and he represents them all, still haunted by what happened. And chances are, when you finish watching, it's this image that will haunt you, too.